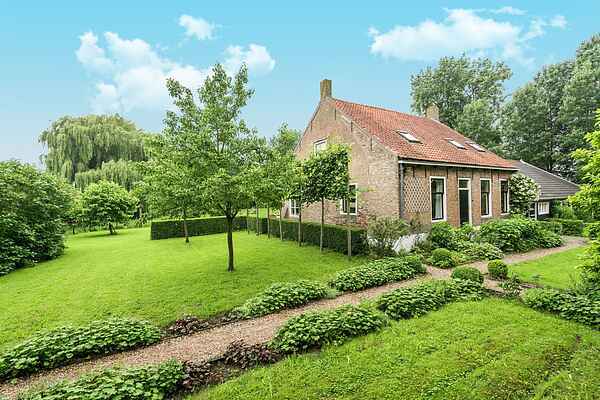 This completely renovated farmhouse from 1733 is located between beautiful medieval dykes with flowers, near the village of Oudelande, Zeeland. The farmhouse is optimally furnished for 8 people and will incidentally be rented out for up to 10 people. In case there are 10 guests, a single bed with trundle bed (2 x 90 x 200 cm) can be used on the landing. The house is kilometres away from the built-up area and offers serenity, space and a beautiful view. There are no neighbours within a 500 metre radius and the house is situated on a plot of about 0.5 hectare. Part of the property is fenced and is used for sheep during the summer months. The property is surrounded by orchards and the house is located along a rural cycling route. The spacious (250 m2) and tastefully furnished home with (partly) antique furniture is surrounded by a large garden. This way you can find a quiet spot on any side of the house - in sun or shade - to relax or retreat to. There's a large terrace on the south-west part of the house. Here you'll find a a long dining table, garden furniture and a mobile parasol. Peace and quiet guaranteed. On the lawn you'll find a swing and a trampoline, nice for the children! There also is a boules court where you can throw a ball. The garden is completely enclosed by a fence and one side by a small ditch. The farmhouse, garden and surroundings are very suitable for families with children and possibly with pets. The entrance of the house is through a hallway with toilet, hangers and boot rack. After this, you'll enter the pantry, where you'll find a large fridge with freezer compartment. Here you'll also find a large metal barbecue, a foosball game, shuffleboard and all kinds of toys to play with on the lawn. In this room you'll also find the garden chairs with matching cushions, as well as the parasol for the terrace. By means of a step you'll enter the living suite, which consists of a spacious dining room and living room. The open kitchen is equipped with a refrigerator, hood and all other modern kitchen amenities. There's a gas cooker and steam oven. A hall with beautiful antique tiles brings you to the shower/toilet with heated towel rack, as well as to the "opkamer", a room which is typical for farmhouses in Zeeland. This tasteful room with a view of the garden is situated above the basement and can be reached by means of two steps. In this room you'll find sleeping accommodations for 3 people as well as a washbasin with warm and cold water. From the open kitchen, a staircase with double handrail leads to the first floor. On this floor you'll find a spacious bathroom with hand shower and toilet. The children will certainly enjoy themselves with the children furniture, a crafts table with chairs, an antique doll house, children's books, etc. The stairs can be closed off, so that the children can play safely. The three bedrooms on this floor floor, sleeping 5 in total, each have their own colour. The Velux windows feature blackout roller blinds, so sleeping in is not a problem! One of the bedrooms has a washbasin with warm and cold water. The holiday home is located in the area "Zak van Zuid-Beveland", which means lots of cycling and hiking possibilities, for example in nature reserve De Zwaakse Weel near Kwadendamme and around the picturesque village of Nisse. There are good restaurants in the immediate vicinity (like in Goes and Yerseke) and there even is a two-star restaurant nearby (Inter Scaldes in Kruiningen). Cities like Gent, Antwerp and Domburg can be reached within 40 minutes. Between mid-April and mid-October, you should certainly not miss a trip with the steam train from Goes to Hoedekenskerke (or the other way).